One of my favorite writers is Rick Reilly who writes the back page article every week for Sports Illustrated. His article is the first thing I read when I get SI. This week's article is especially poignant and a good example of why he is one of the best at what he does. Reilly started a charitable organization this year called Nothing But Nets. 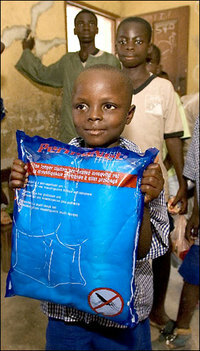 Nothing But Nets' purpose is to provide mosquito nets to African children. An astounding 3,000 of whom die every day from malaria. That's the equivalent loss of all of the children in Spring Branch ISD schools every 11 days. The cost to provide a child with a life-saving net -- $10. Skip lunch today and save a child's life. As Rick Reilly says in the article, it's the alltime no-brainer. Click here for more information or here to donate. I have also added a link for Nothing But Nets on the left side of this blog. Seven months ago you and I found out that each day 3,000 African children die of malaria for the very sad reason that they can't afford mosquito nets over their beds. Didn't seem right to us. Sports is nothing but nets -- lacrosse nets, cutting down the nets, New Jersey Nets. So SI started the Nothing But Nets campaign. Doctors guaranteed that if you sent in $20, you'd save at least one kid's life, probably two. It was the alltime no-brainer. Skip lunch; save a life. Buy the Top-Flites instead of the Titleists; save a life. Don't bet on the Redskins; save a life. Nothing to research. No government to topple. No warlords to fight. Bless your little hearts, all 17,000-plus of you who chipped in more than $1.2 million -- enough to buy 150,000 nets, which the United Nations Foundation and the World Health Organization started hanging all over Nigeria, where kids younger than five are getting murdered by mosquitoes that come out only at night. I know, because I saw the nets. Just got back. Feel a little bad about going without you. After all, it was your money. So let's pretend it was you who made the trip, not me. Remember? Everywhere you went, people mistook you for King Tut. Women got down on their knees and kissed your hand. Whole towns threw festivals. The king in every ward summoned you to his one-room, one-lightbulb palace. One pointed his horsehair scepter at you and pronounced, "Thank you for dee nets. All my wives use dem!" Turns out he has four wives and 23 kids, and they're all under the nets, which is a good thing because the open sewer that runs right outside his shack is a kind of one-stop malaria center. Everywhere you went, 40 people followed: doctors and nurses and random government suits and guards with AK-47s and vice-kings. You rode in an eight-truck caravan past unimaginable squalor, vans on fire and guys selling caskets on the street -- a very good business in Nigeria, where the average life span is 47. And every time you opened your car door, two drummers beat a skull-busting welcome. You'd pull into a school, and the principal would hang a ribbon around your neck and say something you couldn't hear. "What?" you'd holler over the drums. And you'd shrug, and he'd gesture to the 200 kids behind him, who were chanting something over and over, their faces beaming. Later you'd find out it was, "Thank you, white person!" And they'd play a soccer game in your honor that featured nine-year-olds who played like 14-year-olds in the U.S., on fields full of weeds and trash, with goals made of tree branches. In three games the closest thing you saw to a boy with shoes was a set of brothers who wore one sock each. And they'd hand you the mike, and you'd try to say how blown away you were and how you wished you could raise 100 times more in donations, because already one hospital in Nigeria is saying that since the nets went up, outpatient cases of malaria have dropped from 80 a month to 50. But they'd all put their hands to their ears and go, "What?" When you bribed the drummers into taking a union break, you finally met the people you'll never forget: the mothers. Turns out they're nothing but nuts about the nets. In fact, so many mothers want the nets that to get one, the World Health Organization requires them to bring their kids in for a measles vaccination. How often do you get two for one on diseases? You met a mother who walked half a day to get a net. You met a woman who sleeps with her four kids under her net, maybe because she knows that three out of every 10 child deaths in Nigeria are from malaria. In the fetid slums of Lagos you met a woman named Shifawu Abbas who's had malaria twice. "Everybody wants the nets here, everybody!" she said, beaming. "My sister visited from the country and tried to steal it from me!" Still, as you were climbing back into your air-conditioned SUV, she yanked back your hand and begged, "Please? Can I come with you?" On the last day you met Noimot Bakare, a mother whose youngest child died of malaria. She was so grateful that she trembled as she spoke. "Malaria is killing our children," she said, holding her toddler. "There is so much need here. God will bless you for the work you are doing." Please go to NothingButNets.net and keep it up. For that, we humbly fumalk apoplia.